The most fabulous textile resource exists for us here in the Museo Textil de Oaxaca. It's only a small museum, but it has a large collection – some 7,000 pieces – mostly from Oaxaca, but also from around the world, and a great reference library for research. There are two exhibitions on there at the moment, one I've written about on Instagram and the other is 'A Cotton Thread – A Path to Freedom'. This exhibition tells the story of a Zapotec community in San Sebastián Río Hondo that was losing its livelihood. The village is located in the southern mountains of Oaxaca and weavers there had previously made their living through the sale of handmade woven woollen products. Wool is not native to Mexico and was introduced by the Spanish during colonisation. Due to the loss of pastures over the years, farming sheep is no longer viable, and with that has gone the supply of wool. Mark Brown, who is a long time resident of San Sebastián Río Hondo, as well as having spent years in India, thought that introducing the khādī movement to the community might enable them to return to self-sufficiency. This movement was developed by Ghandi, and encouraged Indians to resurrect old traditions by learning to spin the cotton they had grown and weave it themselves rather than ship it to Britain where it was processed, returned to India as cloth and sold at much higher prices. 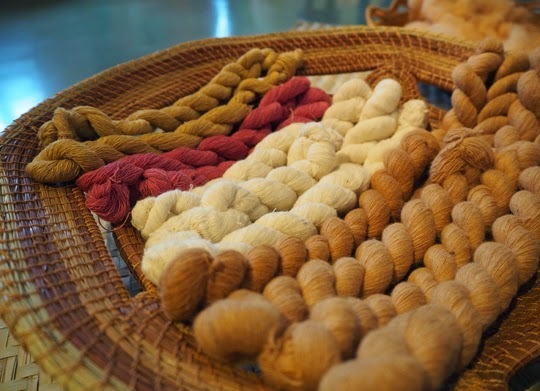 Mark began with one family and a couple of spinning wheels (known as charkhas) and the women brought their knowledge of spinning wool to the task of spinning cotton. Now there are more than 45 families involved in the enterprise and the quality of the cotton has increased exponentially over the last few years. 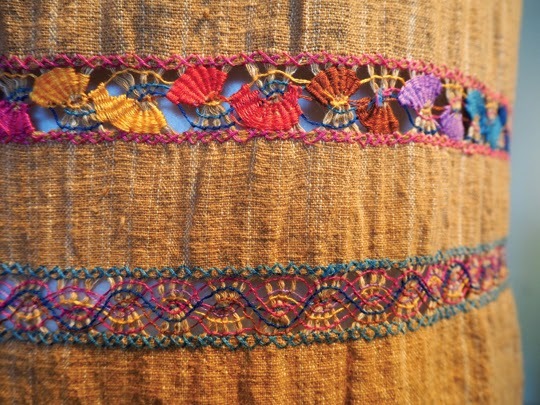 The fabric is woven on both backstrap and treadle looms and a number of the pieces are embroidered. 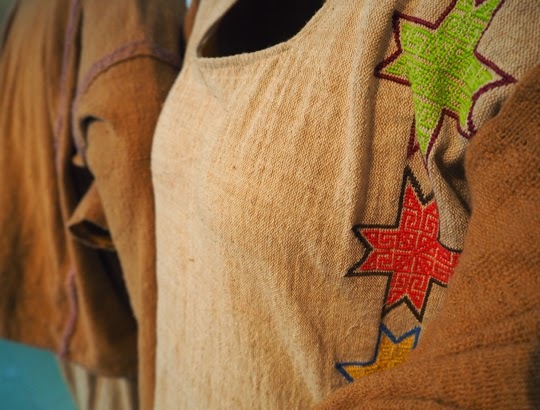 Much of the cotton in this exhibition is the organic Prehispanic coyuchi cotton which the villagers are acquiring through exchange with another community on the coast of Oaxaca. It has a beautiful natural colour. The work is being so well received that the community is really working together to figure out how to manage their next steps and the museum is also talking with them about how they can transfer this sustainable success story to other communities. Everything about this exhibition was beautiful and I just love hearing stories like this, of communities coming back to life through a tradition that is sustainable and was theirs all along. Simply gorgeous and what an inspirational story. It is, isn't it Stace? 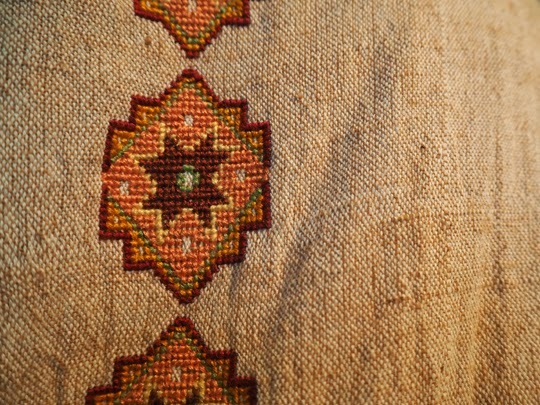 I just love the colour of the pre-colonial cotton. Wow! 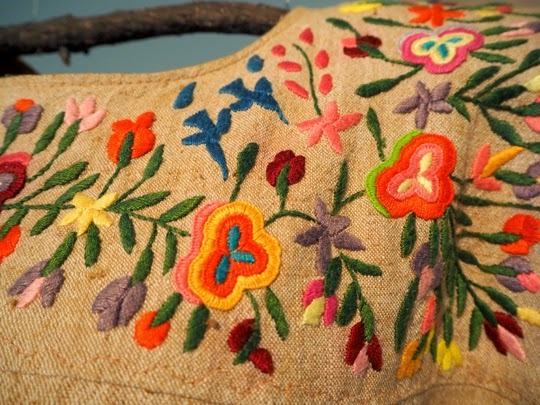 that embroidery is beautiful. And those cotton garments would be so cool to wear in the heat. It is lovely isn't it? I think I'm going to try some of these techniques when I get to my embroidery weeks. Beautiful story, colours and work.